So often, we only focus on the skin of our faces. But the rest of our skin deserves some pampering too! Here are some popular body treatments to pamper yourself from head to toe. Like a facial for your entire body, body scrubs will leave your skin smooth, soft and hydrated. During a body scrub, gently abrasive and delicious smelling concoctions of sugar, salt, or coffee grounds along with aromatic essential oils like lavender and rosemary are featured. You’ll lay on a massage table while a therapist lightly scrubs your body, then rinse off in the shower. Some clients choose a scrub on its own, while others combine a scrub with a massage or a body wrap. This treatment is also called a body polish. Scandinavians and Russians have long used natural bristle brushes on their skin. This technique exfoliates, detoxes, boosts circulation, and even minimizes the appearance of cellulite. Starting at your feet, your therapist brushes in small circular motions towards your heart to improve lymphatic flow. Clients often like to follow dry brushing with a massage, body mask or wrap. 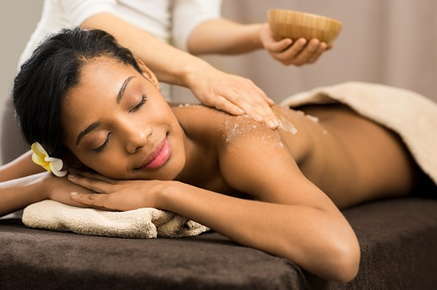 Usually a body scrub or a dry brushing precedes a body mask and wrap. Then, depending on the desired effect, the therapist will slather something wonderful on your skin. If you want to detox, expect your therapist to cover you in algae, mud or seaweed before wrapping you in plastic and a thermal blanket. The mud or seaweed is the mask. The plastic and blanket, the wrap. The wrap raises your body temperature and opens your pores so that your skin better absorbs the mask. A hydrating wrap involves lotion or cream instead of mud, and leaves your skin smooth and soft. They’re perfect if you’ve spent a lot of time outdoors in the wind, snow or sun. We recommend hydrating wraps to clients who love to surf or ski. A slimming wraps take a little longer, as each of your limbs will be individually and snugly wrapped in mineral-soaked Ace bandages. We measure you before and after so you know how many inches you lost. This is a perfect wrap before a big event, such as a party, wedding or performance. We look forward to scrubbing, dry brushing and/or wrapping you. We know you’ll feel the benefits immediately, and will walk out with a radiant smile and glowing skin. Call us today to schedule a spa body treatment.